The Dawn spacecraft left asteroid Vesta behind nearly two years ago, and the Dawn science team has been using the long cruise between asteroids productively. Many of the papers recently published about Vesta concern the enigmatic "dark material" that appears in splotches on its surface. It's not hard to see from geologic mapping that Vesta's dark material is usually associated with craters, but there is a wide gulf between observing an association and understanding what the dark material is and why it appears where it does. I've been reading these papers about dark material and planning to write about them, but I knew that anything I wrote would be much better if I could illustrate it well. Dawn took lots of photos of Vesta but the data set is really hard for amateur image processors like me to work with because the combination of Vesta's lumpy shape and its fast rotation makes features shift a lot from Dawn photo to photo. Putting pretty mosaics and color combinations together requires more than Photoshop; you have to be able to drape the Dawn images over a good 3D model of Vesta's shape, and that's beyond my skill. So I asked Björn Jónsson for help, and he responded recently with some fabulous work on processed Dawn images. 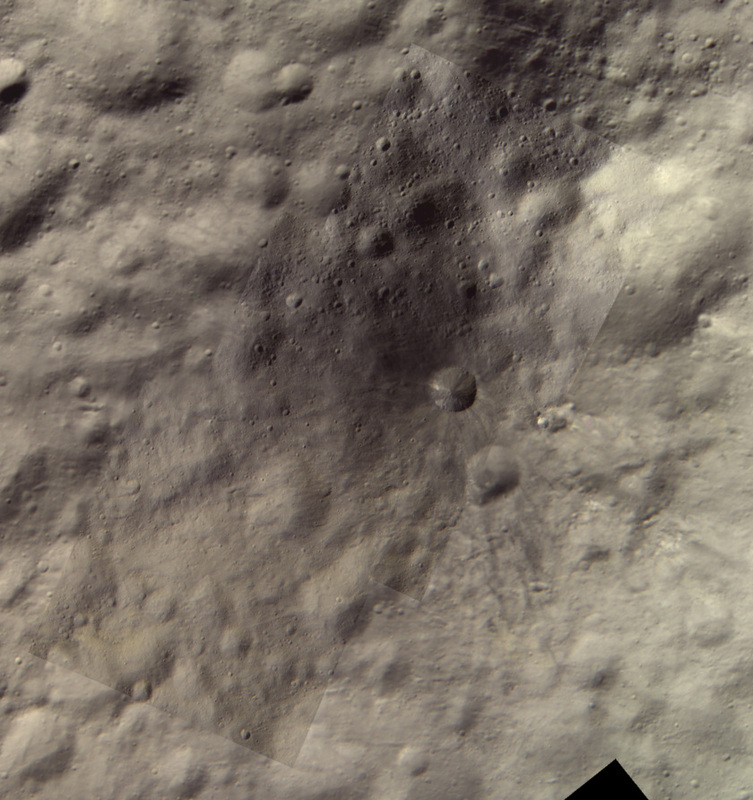 All of the images in this post concentrate on one of the darkest spots on Vesta: Aricia Tholus. 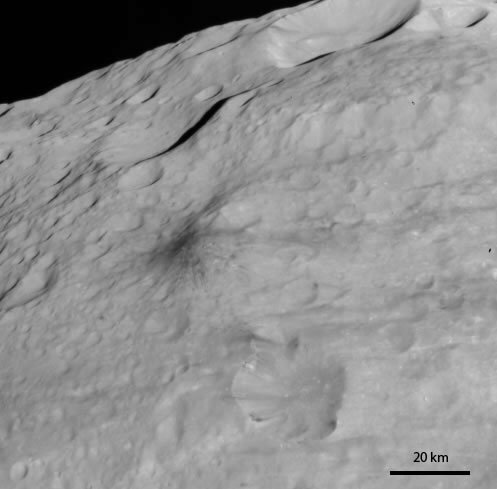 A tholus, according to the International Astronomical Union, is a "small domical mountain or hill," as opposed to a mons, which is a "mountain." I guess a tholus is smaller than a mons. The IAU descriptor terms take pains not to imply any explanation for how a tholus or a mons formed -- it's up to geologists to figure that out. An approximately-true-color view of Aricia Tholus, Vesta, obtained by Dawn on October 26, 2011. 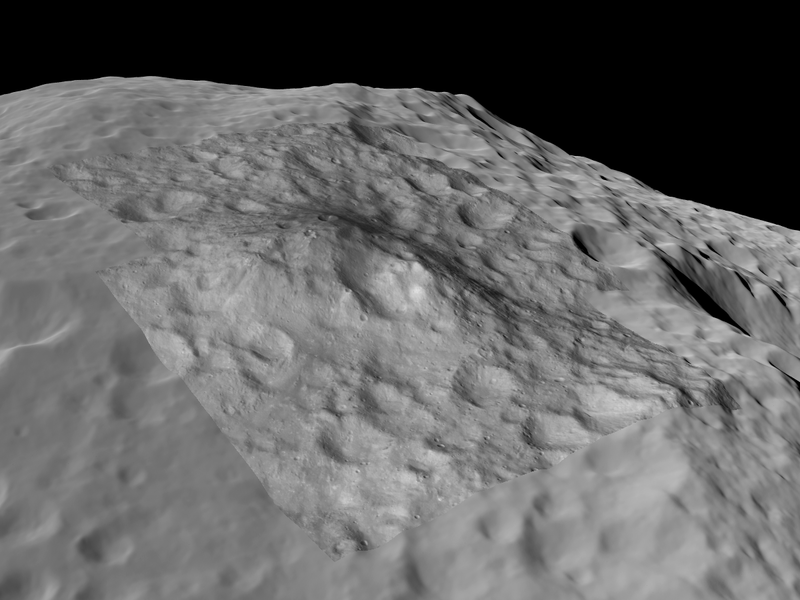 As they approached the second-largest of the asteroids, Dawn scientists hoped to see evidence for surface volcanism on Vesta. Early on in the mission, Aricia Tholus seemed like a good candidate to be a volcano. It had a peaky shape and a spray of dark material centered on the peak. 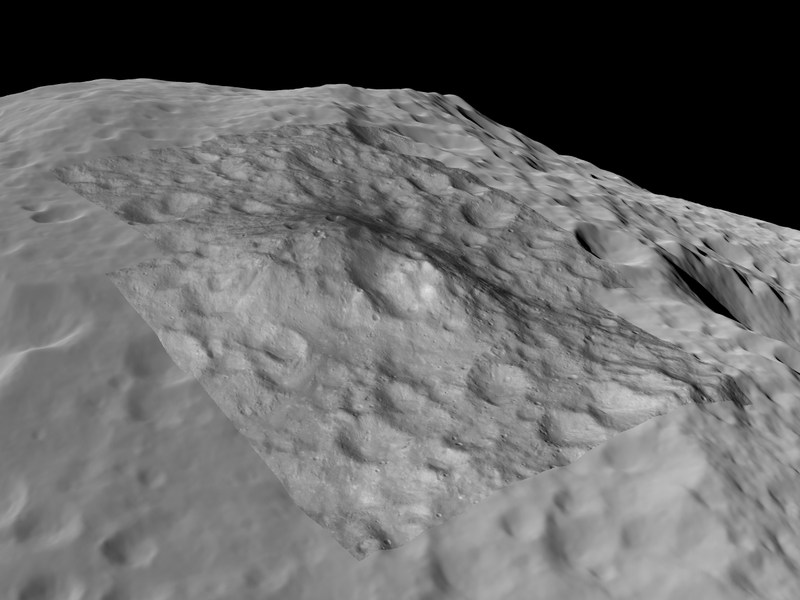 An enigmatic dark hill on Vesta taken during the Survey Orbit phase of Dawn's mission, on August 12, 2011. 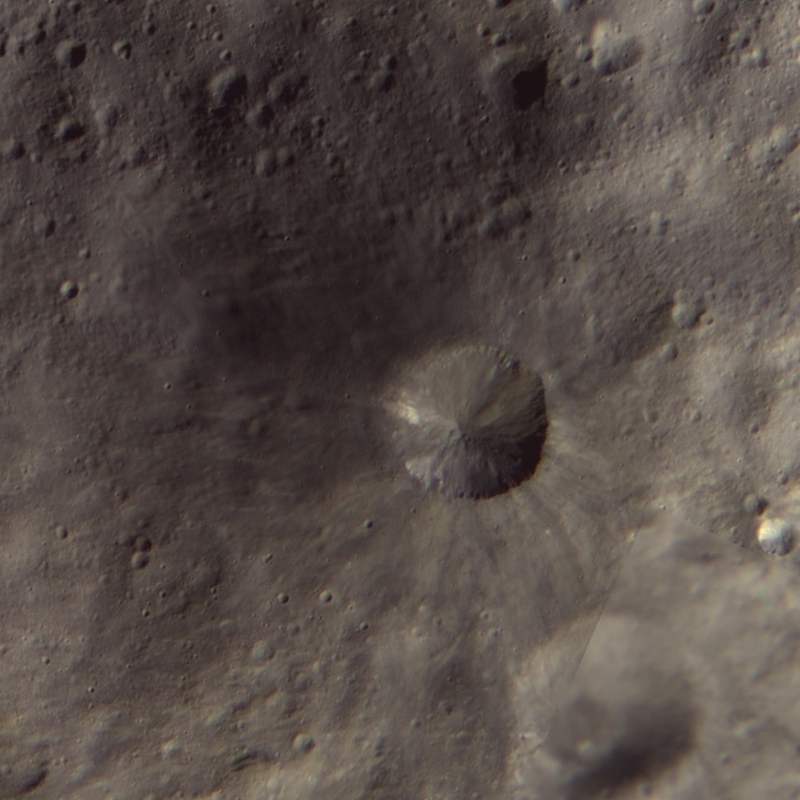 Aricia Tholus is a hill on Vesta with a relatively fresh impact crater at its peak. The ejecta from the impact crater is some of the darkest material on the surface of Vesta. 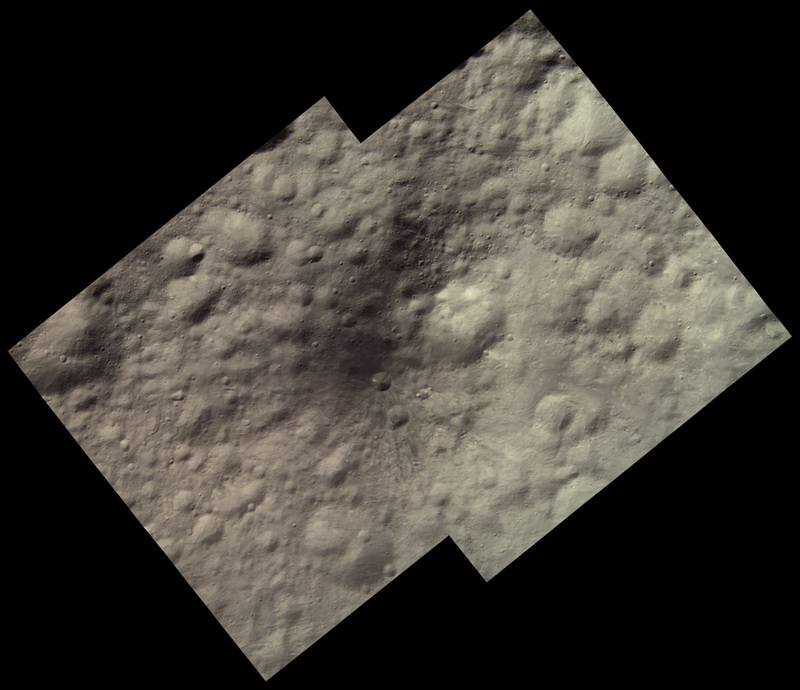 This photo combines color images taken during Dawn's High-Altitude Mapping Orbit with higher-resolution images taken during the Low-Altitude Mapping Orbit. The HAMO images were obtained by Dawn on October 26, 2011 and the LAMO images on April 30, 2012. Zooming in even further, you can see lovely structure in the rim of the crater, and you can also see how the crater's continuous ejecta blanket softens the appearance of the landscape out to about one crater's width around the rim of the crater. 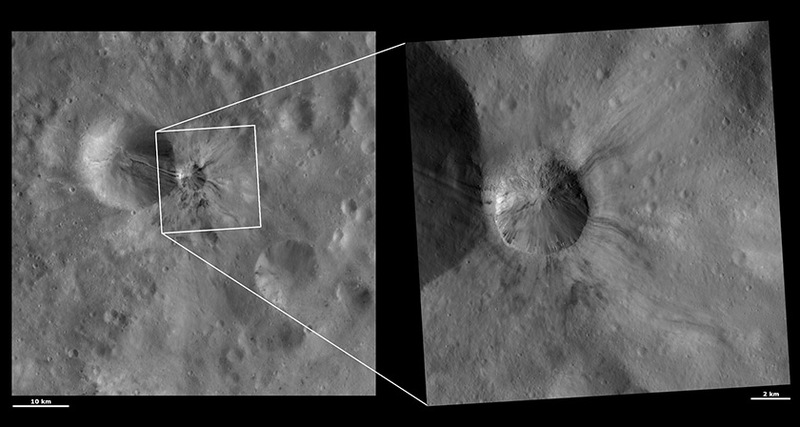 It looks similar in many ways to another crater on Vesta that is associated with dark material, Aelia. So, is Aricia Tholus just a crater, or something more? There's nothing particularly unlikely about an impact happening on or near the peak of a pre-existing hill. But why is the crater's ejecta so dark? Does it have something to do with the composition of the impactor? Or maybe it just happened to land on an interesting deposit of Vestan dark stuff that just happened to be concentrated in the peak of a mountain? That's beginning to seem like an unlikely event. It's a curious feature, a puzzle yet to be solved!